Welcome to the Beau Rivage Palace..
Can one fall in love with a bathroom..? Absolutely..
My Moschino skirt feels fantastic too.. In this bed dreams are so much more sweeter than sweet..
And of course FTV plays in the evening..
And FTV plays in the morning..
After enjoying the beautiful outdoor swimming pool, the gym, the Hammam sauna followed by this spectacular Bvlgari bath..
..me and my MaxMara dress are ready for an apéritif at the Bar and a sushi/sashimi/maki dinner at the Miyako Restaurant.. "A table for one please.." Absolutely fantastic..
As long as it is continental.. It feels like a dream, but this is real..
Of course the Hôtel Des Trois Couronnes is amazing.. It has a perfect terrace with a fantastic view over the Lake Geneva.. Yet in a world of absolutely excellence, the spirit of details is all that counts.. Here is where you find the most perfect perfection in Vevey.. The Grand Hôtel du Lac: A Relais&Châteaux, a member of Swiss Deluxe Hotels..
Where the interior emanates an awesome combination of opulence, taste and harmony..
What amazed me the most was the fragrance which wafted through the corridors.. Enchanting..
And then, there is this fairy-tale garden.. Which can be admired from La Véranda.. In this wonderful garden, a gentleman is sitting. Henryk Sienkiewicz.Polish novelist. One of the best who won the Nobel Prizefor Literature in 1905. 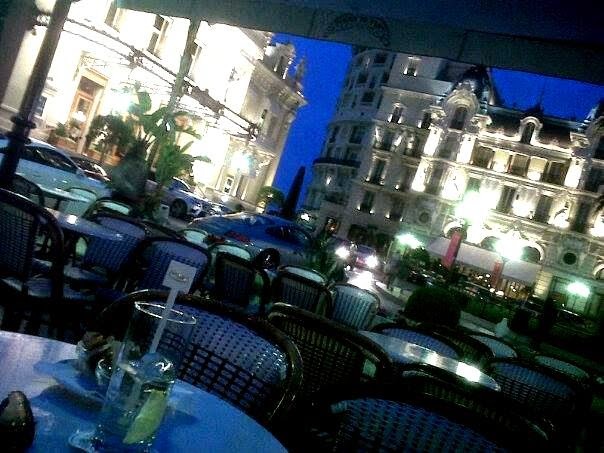 He emigrated to Switzerland and lived in the Grand Hôtel du Lac. An absolutely perfect choice. Special thanks to the Totem Fashion team for these beautiful pictures. Once again, the color comes from Paris..
Monte-Carlo, Moët&Chandon and.. Marc Chagall..
Born on 7 July 1887.. So just in time for his 127 birthday, I went to Evian to see a fascinating exhibition "Impressions" in the Palais Lumière..
First of all, it's all about location, location, location.. De Grisogono illustrates..
Secondly, enjoy.. As Impérial as you can..
Thirdly, dream.. And follow your American Dream..
Fourthly, spoil your senses.. Preferably at the Gstaad Palace Spa..
Fifthly, eat well.. Restaurant Megu at The Alpina Gstaad..
Eightly, travel..! In order to get inspired.. Monte-Carlo..
or in order to have a little shopping..
Ninthly, have great moments with your friends.. God save our Champagne Club Gstaad..
Tenthly, fall in love.. Chanel forever..
Feel free to choose the right order and..